Ee Soon Wei in the type library in the back room of the Royal Press in Malacca. The Royal Press turns 75 this year, and it is all set to start a new chapter in its history. THE doorway is small. Hidden, almost. The millions of tourists who throng historic Malacca every year may fail to notice the unassuming doorway of this double-storey shophouse as they stroll along the famous Jonker Walk, looking for souvenirs. Unlike the shops selling T-shirts and trinkets, no one stands at the entrance to beckon you in. You walk in anyway. Welcome to the world of the Royal Press, a printing company founded in 1938 by family patriarch Ee Lay Swee. In the 1940s, the Japanese invaded Malaya but the family business was spared because they printed Japanese-language documents. Business boomed in the 1950s but by the 60s, the Royal Press faced a bigger threat: offset printing technology. The family had the money to expand but they made a strategic decision not to buy new machines. Instead, they decided to continue using the labour-intensive letterpress cylinder machines – to protect the livelihood of their loyal staff. Because of that strategic move, the Royal Press is now one of the oldest surviving letterpress publishing companies in the world; it has printed materials in four languages: English, Chinese, Arabic and Tamil. Here, the words are still set by hand one letter at a time. “Leading” has nothing to do with leadership; it literally means inserting and arranging pieces of lead on a block which is then inked on paper. This ancient, near-extinct technology cannot contend with the 21st-century world of gargantuan offset printers that spit out pages thousands of times faster – and are sharper and cheaper. The Royal Press is evidently behind by time. They are not alone. Within historical Malacca, the blacksmiths, tailors, laundrymen and silversmiths have all but disappeared from Jonker Walk (while the coffin-makers and funeral parlours mysteriously survive). The silent disappearance of such a cultural heritage does not augur well for the state. The Government has publicly acknowledged the need to preserve and revive living heritage – which is a big draw for international tourists who come to Malaysia, one of the world’s top 10 tourist destinations. “All famous cities in the world have unique attractions that define the distinctive character and identity of the city,” says the Economic Transformation Programme’s annual report. For the past four years, Ee Soon Wei, 33, scion of a multi-generation family of printers, has been mulling over plans to rejuvenate the Royal Press. His mission is to keep traditional family values and the letterpress business alive. Ee is working on creating new letterpress products and organising guided tours by collaborating with local and international designers, artists, writers and community organisers. “The Royal Press turns 75 this year. We want it to survive till 100,” says Ee, the managing director of TRP Management Holdings, a startup which focuses on managing new initiatives for the Royal Press. Ee works closely with his aunt, Ee Joo Guat, and four family members who comprise the Royal Press’s board of directors and shareholders. “I accord great respect to the printing legacy: the paper, the people and my family’s perspectives in sustaining the business through the years. At the same time, I want to add value through content creation,” shares Ee. He is counting on the likely odds that at least some of the millions of international and local tourists who converge annually on Malaysia’s oldest city will choose to walk through the doors of the Royal Press and be intrigued by this new “living museum” which provides an authentic heritage experience. If the Royal Press succeeds in reinventing its business model, Ee hopes that their story can serve as a case study for preserving and rejuvenating living heritage in Malacca, a Unesco World Heritage site, while boosting tourism. It is an exciting vision and things are starting to fall into place for the young entrepreneur. But it is a race against time. The company is still bleeding red ink. The machines lubricated by grease and ink are outnumbered by machines coated in rust and dust. And the skilled workers are not getting any younger. Given the monumental challenges, how will the reinvention take place? To understand this, you’ll need to walk past the “No Admission” sign and step back in time, into a hushed, still room filled with a million pieces of lead. As you enter the arched doorway, you gaze reverentially at the silent machines, stacks of ancient paper and a beautiful spiral staircase made of deep dark wood. Turn the corner and you are mesmerised by the Original Heidelberg machines – clanking, churning, wheezing and spitting out RM5 admission tickets to the Malacca Night Safari. On you go, walking through the doors, rooms, airwells and courtyards of the 43,200 sqm shophouse until you arrive at the heart of the Royal Press: a sun-lit room where, back in the 1960s, 30 people of all races and ages used to arrange typeface and letterpress blocks. These blocks were used to print stock certificates, company manuals, circus posters and bus tickets. Now there is only one skilled typeface composer left: Foong Yoke Chan, 74, who is fondly referred to as Ah Chan. Ah Chan’s workstation worked its magic on Ee when he returned to Malacca on weekends as a respite from his marketing job with a global consumer goods company. Ee marvelled at the touch and feel of the typeface blocks – not pixels on a computer screen but weighty blocks of lead arranged by hand, one letter at a time. “I was searching for a deeper meaning to work and life,” says Ee. 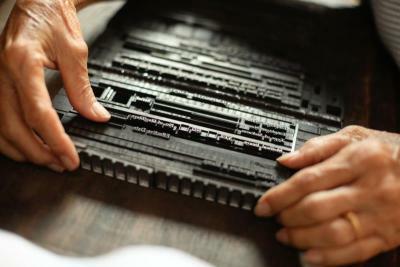 He set out on a quest to understand the roots of letterpress printing at the Gutenberg Museum in Mainz, Germany. “The museum director was expecting a white-haired archivist. He was surprised to see a 60-year-old man in a 30-year-old body,” recalls Ee, with a smile. 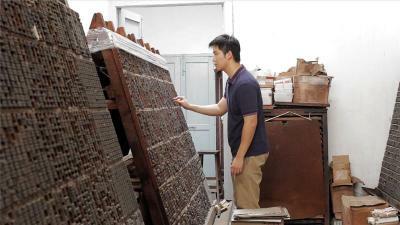 Ee also went to Taiwan to view the world’s only complete set of traditional Chinese character molds made out of lead. The travels and ongoing conversations with members of the Ee family sparked off something within Ee’s heart. He was deeply moved by his unlettered grandmother’s entrepreneurial spirit. A widow with eight children, she regularly woke up at 5am to collect petals from bougainvillea plants. The petals were stuffed into brown paper bags (recycled from the print shop) and sold in the market for RM1 per bag. She used the hard-earned cash to buy stocks which were invested into properties located in prime areas. In her own unique way, Ee’s grandmother had transformed petals into property, and paper into print products. That story inspired Ee to quit his day job to join the family business. “At first, I didn’t have the experience to run the family’s printing business, and I found myself really struggling,” says Ee, a graduate in marketing from the University of Melbourne, who recently took on the role of CEO of Art Printing Works, a commercial printing plant in Bangsar, Kuala Lumpur. 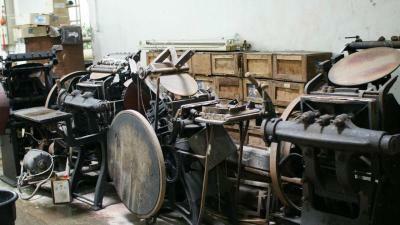 Two movable type machines and an old typewriter (right) which were a big part of the Royal Press’ work in Malacca. Ee’s admiration for his grandmother, who passed away when he was 17, led him to an epiphany: if she could do it, so could he. She depended on God, so did he. And he had his grandmother’s spirit and stories to sustain him. Over the past year, Ee set out to discover new stories from old traditions, and breathed new life into old paper. He has collaborated with 3nity, a branding consultancy, to study windows, gables, tiles, beams, vents, roofs and signages of Baba Nyonya buildings. And these have now inspired the product development of notebooks, calendars, angpow packets, handmade letter-writing sets and family heirloom address books. “We want to preserve the family story, preserve the craft of this place, and create products and experiences of international standard,” says Luke Teong, founder and design director of 3nity. On my weekend visit to the Royal Press, Teong and Ee were finalising a guided tour that would teach tourists how to print using the letterpress, while observing the Royal Press staff at work. A soft launch is planned in March; the living museum will open its doors in June. Ee hopes their collaborative efforts will one day transform the “no admissions” printing press into an “open house” where stories and the art of letterpress will make the Royal Press a must-visit place in Malacca and an educational hub for rejuvenating the craft of letterpress. By the time I re-emerged from the arched doorway into the outermost room of the Royal Press, dusk had fallen. I could see the thickening hordes of tourists descending upon the Saturday pasar malam. In months to come, these will be the ones who would one day walk through the arched doorways to retrace the roots of the written word – just as I did. ■ Alvin Ung is a facilitator, executive coach and author of bestseller, Barefoot Leadership. 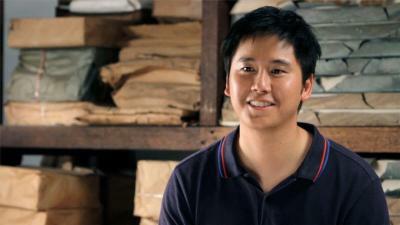 To view more videos, photos and insights on Ee Soon Wei’s journey, visit www.businesscircle.com.my. The column and multimedia content are a collaborative effort between the columnist and the Economic Transformation Programme.